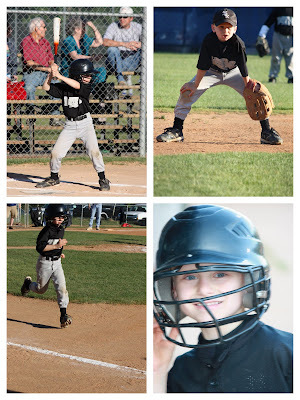 Tonight was the last ball game Jackson will play of the season. They have a game on Friday but we will be lovin on Mickey and Minnie! He has had a great season and done really well. He also got the game ball at tonights game b/c he caught a pop fly. I wish I had a picture of his face when he caught it... he was very surprised to say the least. B/C catching pop flies is not something that happens all the time in 5 -6 year old baseball. We had his team party tonight too and he got a very nice trophy... he was so excited! He is sleeping with it as i type! Daddy was one of the assistant coaches and he got a "trophy" too... my favorite boys and their trophies!